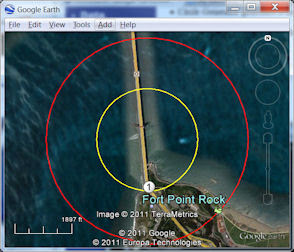 KML Circle Generator generates a circle at center of current view or provided center point. Enabling auto-refresh option maintains a circle in the center of the view to give a sense of scale as you navigate the world in Google Earth. If auto refresh is checked then the circle is redrawn whenever you stop moving otherwise circle is drawn when Network Link is initially loaded and when it is manually refreshed. 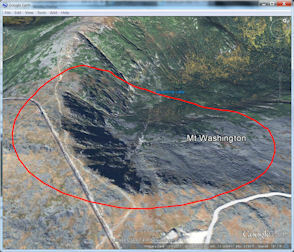 Note the circle geometry is clamped to ground and will follow the terrain so for example a hilly or mountainous region will show distortions of the lines as it clamps to the ground as shown in picture below on the right. Google Earth (TM) and Google Maps (TM) are registered trademarks of Google Inc. KML4Earth is not affiliated with Google.